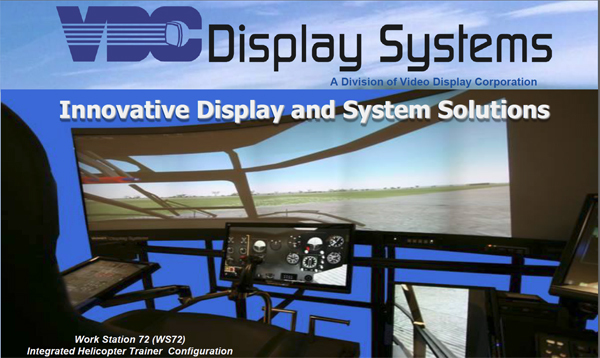 ATLANTA, May 9, 2012 (GLOBE NEWSWIRE) â€” Video Display Corporation (Nasdaq:VIDE - News) is pleased to announce that its simulation division, VDC Display Systems (VDCDS), will launch the Workstation72, a new display product for multiple military and commercial uses at the ITEC 2012 Conference on May 22, 2012 in London UK. Based on VDCDS's extensive experience in providing high resolution Display Systems in the Simulation and Training Industry, this new product utilizes Light Emitting Diode (LED) projectors installed in a self-contained, curved, wide screen (72â€³ W x 24â€³ H) display system. This design provides an immersive environment for the viewer that can be used in many applications. It blends multiple images into a single seamless 3040 W x 1024 H resolution image. Furthermore, as the LED projectors have no consumables or moving parts, they are virtually maintenance free. Workstation72 uses the latest technology in professional-quality LED projectors, designed and manufactured to VDCDS's exacting requirements having an operating life of more than 30,000 hours and eliminating the need for frequent light source replacement and set-up associated with lamp-based projector systems. Workstation72â€²s rear projection mini-LED projectors are operated by an internal, customizable PC, with a Windows(R) 7, 64 bit Operating System (OS). The Solid State projectors offer low power consumption which directly translates to lower cooling needs and operational cost reductions. Furthermore, the internal PC can support multiple add-on monitors (to include touchscreens) to expand its capabilities. As Workstation72 only weighs 225 pounds, it can be placed on any standard sized (60â€³) desk top or table. VDCDS can also provide optional screen sizes plus a custom-designed base to suit your special needs. Video Display Corporation designs, develops and manufactures unique solutions for display requirements for military, medical and industrial uses with emphasis on high end training and simulation applications. Its product offerings include ruggedized LCoS, CRT and AMLCD displays as well as complete projection display systems utilizing VDCDS's MarqueeTM and ESCP line of projectors. Video Display Corporation operates eight sales, design and manufacturing facilities throughout the United States and Europe. For more information, visit the Company's web site atwww.videodisplay.com.